I teach at a child development center with children ages 3-5. we are fortunate enought to be located right by the beach. One of our favorite activities is to search for seaglass along the shore. The kids have become master seaglass finders and become very excited when they find unique colours. One of our favorite colours to find is blue. We found this peice laying in the rocks as we walked along the shore. 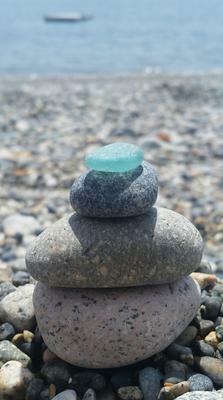 One of the children used it to top a rock stacking and helped to take this photo. Love that color! You guys find the nicest glass down at the beach to cool. I know the kids must love being able to get to the beach regularly, and you have the ideal job for a sea glasser!